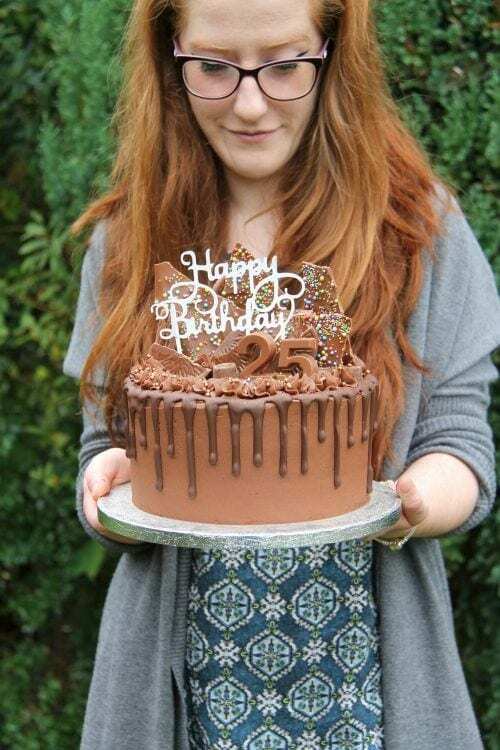 A Chocolate Explosion Birthday Cake for my 25th Birthday! 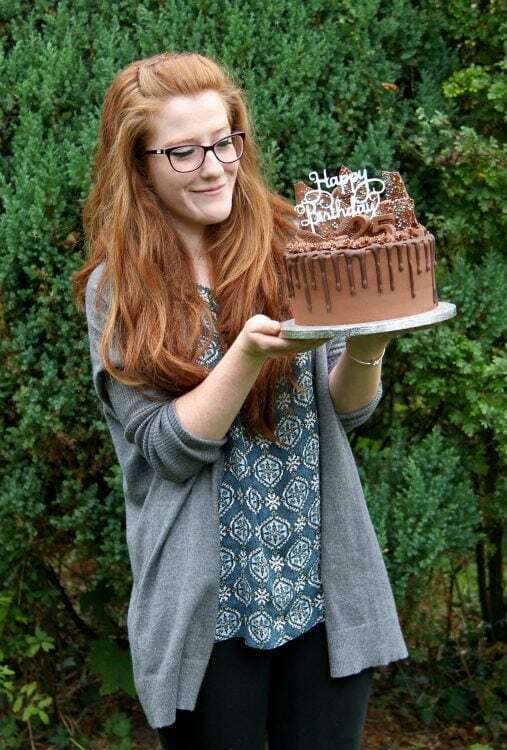 So today, 20th October, is my birthday! 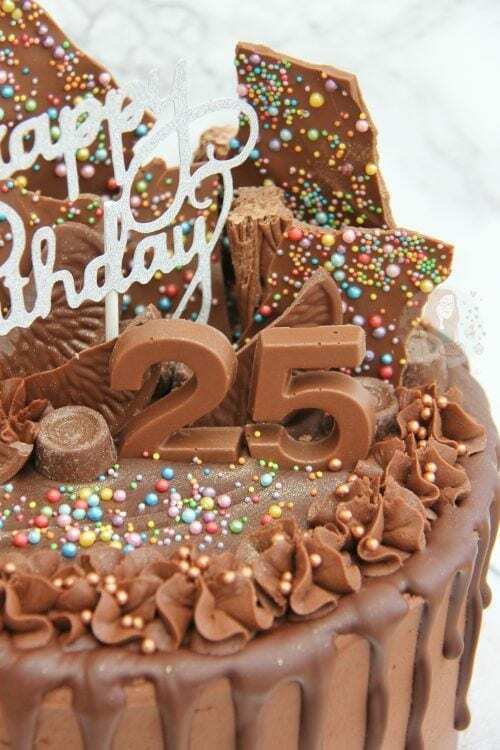 This year, I have turned 25. I’m not entirely sure how I feel about this, so I decided to bake myself a bit of an explosion chocolate cake. FYI, it was heavenly. I love baking cakes and such, but fondant is a bit of an effort for me, so I always prefer to do a cake like this for myself. I love making them as its easier for me, its delicious, and I think they look awesome. 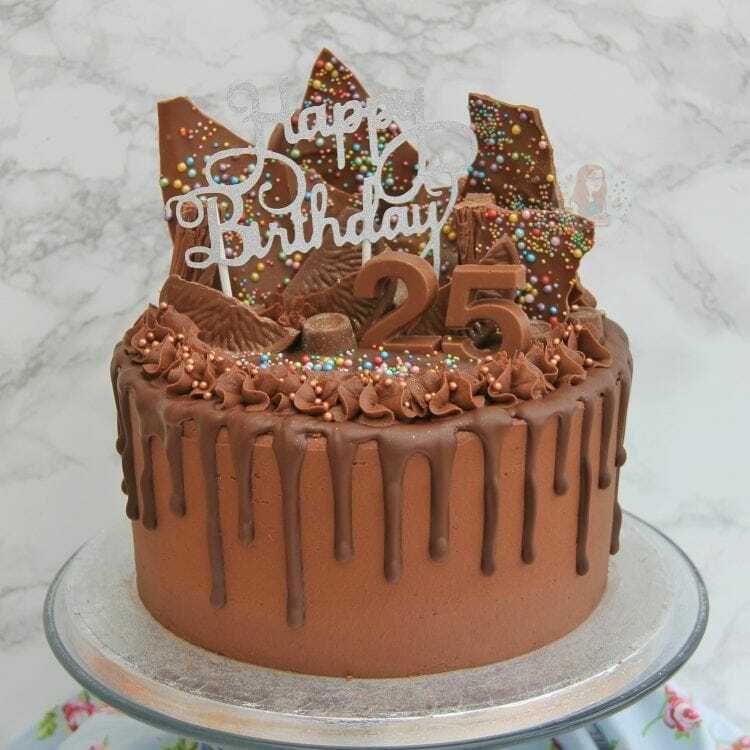 Yes, its a little sad to have to bake your own birthday cake, but I decided to make this one two days before so I could relax on my actual birthday! I merged a few recipes together to create this one, as I was really in a chocolatey mood. I used a cute Silver Happy Birthday Cake Topper from Iced Jems for the Happy Birthday sign, and I thought it just made it that bit more special. To some, it could look messy, but I love it. For the Chocolate Sponges I used the cake part of my Oreo Drip Cake recipe. For the Chocolate Buttercream I used the buttercream from my Chocolate Cupcakes recipe. For the Chocolate Drip I used the the same method as my Oreo Drip Cake recipe. For the bark decoration I made a half batch of my Chocolate Bark, with sprinkles on. I then used some Rolos, Chocolate orange slices, Cadburys Flakes, extra buttercream leftover from decorating, and some Iced Jems Sprinkles, and then a Silver Happy Birthday Cake Topper, and I used a Chocolate Number Mould to create the 25! 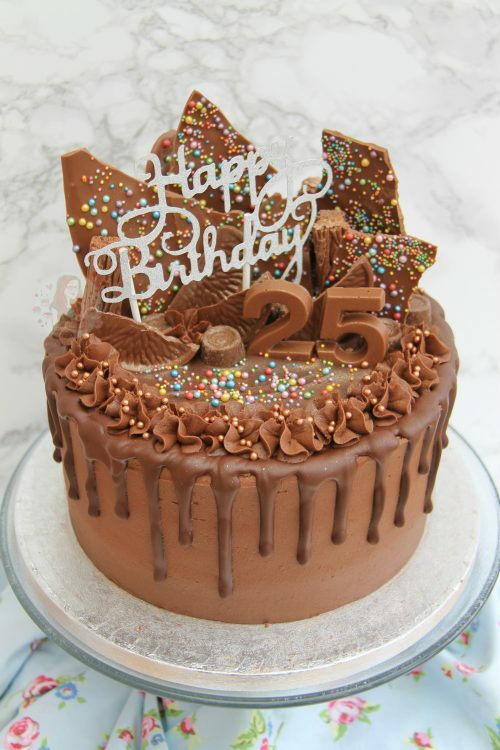 I followed a similar method to my Oreo Drip Cake recipe, and then inserted some Chocolate bark shards, and randomly added things on to get a cool style. Its one of those things you don’t really want to think about too much. Just place and roll with it! These sort of bakes really are an experiment from the beginning, and you learn what you like as you go! 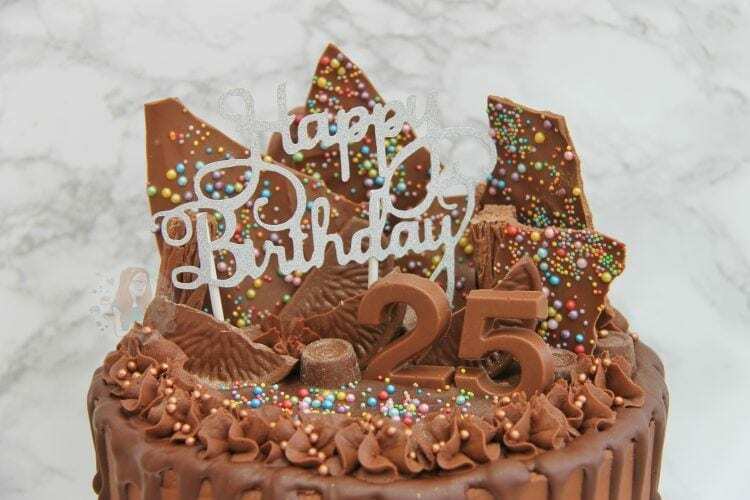 I hope you all love the cake as much as I did, and if you ever want to make your own version then do show me yours by commenting on my Facebook posts, or tagging me on social media like Instagram with #janespatisserie! If you need a little help on how to do a Drip Cake, I’ve posted a video on my youtube channel. It’s not the same, but it gives you the ideas on how to achieve the drip affect! Thank you all for supporting my blog daily, I really do appreciate it. Newer Previous post: Ghost Cupcakes! for the chocolate buttercream, did you use the same quantities as your receipe for the chocolate cupcakes or do i need more as its quite a big cake? I made a big batch as I was baking other stuff at the time as well, but you would probably need at least double! HI Jane, what size isn’t this cake? Is it an 8inch? If I wanted to make a 10inch own much would you add to the ingredients? Hi Jane, do you think the drip will work with Cadbury’s chocolate! I have 850g bar and don’t want to buy anymore unless I have to. Thank you. Oops, exclamation mark is not supposed to be there, it is a question…. I’ve never used Cadbury’s as a drip before, but it might be thicker than regular dark chocolate when melted because of the other ingredients. Its definitely worth a try, but keep an eye on the oil you add! THANK you, which brand do you use for your drip – cooking chocolate the one you find in baking section or eating chocolate the one in confectionary? I’ve just attempted to make this. My buttercream kept dragging the sponge away despite putting on a crumb coat and leaving it for 2 hours. Please can you give me some tips? Thank you. Sounds like your buttercream was far too firm. Try making it slightly softer with 1-2tbsps boiling water. Hi Jane, I am thinking of attempting this cool cake. 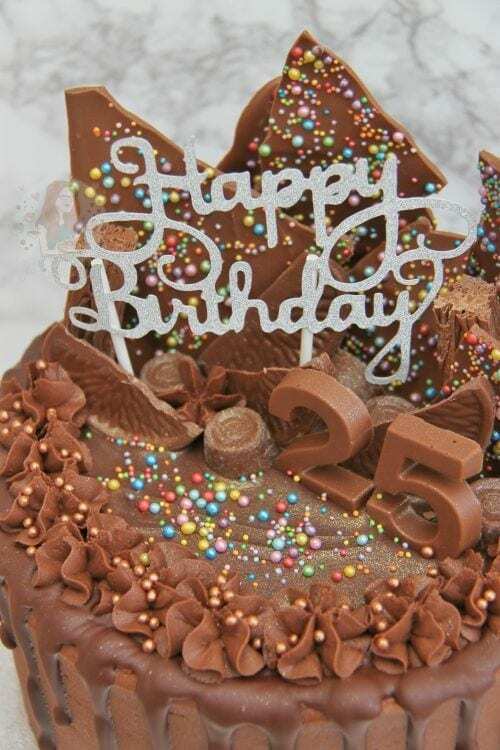 Could you please tell how you make your chocolate bark stand on the cake – do you push it into the cake ? Yes basically you have to carefully push them into the cake! Make the chocolate bark reasonably thick so that it doesn’t break, and wait till its completely solid and push in! How does the buttercream recipe for your cupcakes differ to cover this cake? or is it the same amount? I would use about x3 the amount. Happy Belated Birthday Jane! Hope you will be good. And you enjoyed a lot. Best wishes to you dear. Thanks for this yummy chocolate. I got always good stuff from you. Keep it up. Stunning cake! And Happy birthday! Thank you for all the lovely recipes so far! Oh of course it did – and they’re perfect. ? And thank you! Happy Birthday! That is an amazing cake! that looks amazing – how do you stay so slim cooking all these cakes I would have to indulge!!! You can easily be slim and still eat cake. This looks amazing!!! Going to attempt one today ?. If I don’t bake it, I never get a cake so I thought I might as well haha and thank you!! Loved watching you as I haven’t seen you live before! Hope he enjoys your cake! Your cake looks fabulous – as they all do!